“I brought you here to tell you this: sometimes what we are searching for does not exist. We may sacrifice for it, even bleed for it, but it was never meant to be ours.” I can easily say that 'Drown' will be in the list of my all time favorite books. Even though Disney's version of The Little Mermaid is cute and sweet, I was always a huge fan of the original tale. Drown is everything you're looking for if you love Hans Christian Andersen's classic fairy tale as much as I do. The writing style was beautiful. It had been a while since I had read a book written as beautifully as this one. I felt like I was reading a poem at times. The book was dark but in a good way and now it is on top of my shelves! Overall this book was pure brilliant and I sure will recommend this to everyone I see. I can't wait to read Esther Dalseno's next books. I wouldn't be suprised to see her books everywhere soon, because her writing is one of the best. And can we please take a moment to look at the cover. It's gorgeous! Esther Dalseno is such a beautiful writer! Just FYI, this is nothing like Disney's Little Mermaid. It's based more off of the original Hans Christian Andersen's tale. The story is dark, lush, and touching, and broke my heart in several places. Everything a good retelling should be. Retelling of the Littlefucking Mermaid.Sign me up. Like so many others, The Little Mermaid was my favorite fairy tale growing up. To pay homage to Hans Christian Andersen, I decided to write Drown in such a way that it could almost be perceived as an unabridged yet alternate version of the original tale, found buried in a dusty chest in the annexes of an old Danish library. I hope you all enjoy it. Drown is the perfect rendition of everything I didn’t expect it to be, with everything I hoped it would be. I must admit, prior to Drown, I was not familiar with Han Christian Andersen’s original version, The Little Mermaid. Upon completion of Drown, however, I looked back through the original fairy tale, and although there are similarities between the two, Esther Dalseno completely transforms the story into something both hauntingly beautiful and mesmerizing. "Thus the little mermaid learned her world’s greatest paradox: that their currency was beauty, and their coin was body parts. [...] even though her beauty could buy a kingdom, her sister’s could buy the whole world. "With an unique writing style that stays true to its fairy tale roots, Drown is unlike anything I have ever read. A third person omniscient narrative adds an extra element by telling the story without the incorporation of character names. Although initially I felt a little disconnected with the nameless little mermaid and the fairy tale style narration, the dark and twisted atmosphere provides an emotion to the characters that is disturbing, yet alluring. "It was his face that entranced her the most. It was so beautiful that it was sure to sell for enormous amounts if she peeled it from his skull. "I loved the innocent and inquisitive personality of the little mermaid. From a very young age, the little mermaid senses she is different from her sisters with her human-like qualities and desires. After meeting with the mysterious sea witch, an exchange of her tongue grants the little mermaid her legs, in hopes of marrying the prince and obtaining an immortal human soul. Drown describes our world in a completely refreshing way through the little mermaid's first experience on land. As the little mermaid discovers all the features of being a woman, including experiencing her first period, there were moments of humour that lightened up the darkness of the plot. The interpretation of the little mermaid's surroundings takes the most simplest scenarios and turns them into a metaphorical work of perfection. "The God was going to sleep now, for half of it was buried in the ocean, but the little mermaid was not sad because she knew that she would see it again. Time ticked by, and she did not move, and when the God was fast asleep, she saw its angels emerge in the sky and wink down at her [...]. "With a self mutilating prince, for example, Drown doesn't shy away from sharing a more darker side to its characters. Although the determination to gain the heart of the prince could be described as romantic, Drown incorporates a relationship with a more twisted path to love. The additional relationships that develop along the way, particularly with the prince's uncle, have a mysterious quality to them that leaves a vague interpretation of the characters' motives and feelings.From the history of the sea witch, to the development of the mysterious disease killing the merefolk, there are few direct answers given that provide a completely closed ending. The entire plotline unravels in such a simplistic manner that the connections from the beginning to end feel cryptic. However, I enjoyed the interpretive quality of the writing, leading to an ending that is filled with both sorrow and happiness. With its unique world and unexpected narration, Drown takes the little mermaid to a dark, imaginative, and twisted place. Beautifully dark, heartbreaking tale that remains true to the tragic Hans Christian Anderson original. Loved (view spoiler)[ the narrator. An unexpected twist, as was the ending since, at the last minute, I was fooled into thinking it would be a happy one. So close, so close. (hide spoiler)] I'm very much looking forward to reading more of Ms. Dalseno's work. More reviews @ The BibliosanctumTL;DR Review: 4 stars. What even are feelings right now?Long Review:First of all, I have to say the cover for this book is gorgeous. With that aside, speculative YA fiction and I have a strange relationship. I’m either unmoved by much of it or I outright hate it. I can’t pinpoint why this happens since I enjoy YA books in every other genre. Exception: I enjoy YA horror more than most sci-fi and fantasy YA. However, if there is one YA genre that I seem to dislike more than the rest in the speculative vein, it’s without a doubt fantasy YA. Because of this, when I find a YA fantasy book that I enjoy, I latch on to it for dear life while reading it because I don’t know when I’ll feel so attached to another book in this genre again. And in true fashion, just like the last fantasy YA book I truly enjoyed (we’re getting to what it was), it ended with me wanting to make dying whale noises. Like who told you it was okay to mess with my feelings like that? Who gave you the right? I so mean that in the nicest way possible because I enjoyed this book:I’m doing the Popsugar Reading Challenge again, and this book was my “A book based on a fairy tale” choice. This came to me by chance. I like imaginative retellings, and I have a ton on my TBR. As I was searching my list, Goodreads recommended this book to me because I read and enjoyed Tiger Lily by Jodi Lynn Anderson (a Peter Pan retelling from Tiger Lily’s POV). I don’t think I’ve enjoyed a fantasy YA book this much since Tiger Lily, and I read that two years ago. Don’t believe me. Check any fantasy YA review I’ve written since 2013 and you’ll learn. The blurb for it caught my interest: “Seven emotionless princesses. Three ghostly sirens. A beautiful, malicious witch haunted by memories. A handsome, self-mutilating prince.”Drown is a retelling of The Little Mermaid, but don’t think this follows the Disney happily-ever-after version most people have come to know. This is Hans Christian Andersen dark. The Sea King fathers seven daughters each born a year apart. Merfolk live abnormally long lives, dying at exactly 300-years-old, if nothing takes them from life sooner, and they believe this is so because they do not suffer what is called the Great Condition. Merfolk believe that only humans suffer from this condition, which is why their lifespans are so short. When children come of age within the sea kingdom, they are allowed to visit the surface and observe humans from a safe distance in the sea. It’s during this time when the Sea King’s youngest and strangest child visits the surface that she falls in love with an emotional, disturbed prince, and she decides that she will be human and win his love and a soul of her own (because merfolk believe only humans have souls, given to them by God, while merfolk are some false creation) no matter the cost… and the cost is great.You follow the mermaid as she convinces herself that the prince loves her, that everything he does he does it because of her, for her, while knowing the truth deep in her heart. It’s an emotional journey that explores not just this romance, but the origin of the merfolk and their emotional detachment, the turbulence of new love and the honesty of enduring love, and the emotions that often lead us to make rash decisions, even as we’re warned that emotions, especially love and hate, will often deceive us. The book even starts with this warning: “We are bid to receive the ones that seek us, and grant their heart’s desire. But beware your heart’s desire, for those that seek us hide broken hearts, and broken hearts are divided. They will lie to you, they will deceive you.”Even though this calls itself a “A Twisted Take on the Classic Fairy Tale,” if you know anything about Andersen’s fairy tales, then you know that often these stories are often bittersweet at best, and the original vision is pretty dark in its own right. In fact, this books follow so closely to the original story that it reads like Dalseno is filling out the story while managing to make it feel like a creation of her own. She makes many brilliant, intriguing changes, but if you’re expecting Disney, this isn’t it.With that being said, this is a touch melodramatic even in its beauty and has portions that can come off silly in a dramatic way. Also, I’m not sure I particularly care for how she handled the prince’s cutting, which seemed more for convenience and to make him seem more tortured and dark. Honestly, I’m not sure I bought into the prince’s “tortured soul” as much as Dalseno wanted, but this book was 90% excellent and I overlooked the fact that I spent a good portion of this book thinking, “Shoo, prince. Get your life together, honey. Just get your life.”The handling of the self-mutilation can seem kind of insensitive because it comes off as a superfluous device a bit. I’m sure that’s not how she meant it and others might see it differently, but trigger warning. There were other elements of the book that seemed to be in place more for convenience sake and factored into the story little once they’d serve their purpose as well. These are things that kept it from being a 5-star read for me, but it still goes on my favorites list.In reading this book and thinking about why I enjoyed it much in the same way that I enjoyed Tiger Lily, I realize that I like this complex, lyrical, dark, magical realism style that books like these bring to the table. I enjoy the emotional, visceral journey including most of the melodrama. They’re love stories, but they’re so much more than that. The words and feelings in books like these are haunting, and the exploration of feelings and ideas are poetically moving. These are the kind of books that stay on my mind and I revisit time and time again. MY VIDEO REVIEW OF DROWN: https://youtu.be/cNYViYXbkmo4.5 starsThis book was not what I expected - I was positively blown away! The writing style has a very fairy-tale-vibe to it and I absolutely adored it.I'm not familiar with the classic The Little Mermaid fairy tale but nonetheless I really enjoyed this book. By the end of this book my heart was breaking along with the mermaids. FULL ORIGINAL REVIEW @ HERE!It hurts. It really, really hurts. Oh my God. . .“Drown” by Esther Dalseno was such a beautiful, delicious and heartbreaking read that it’s been almost a month since I finished it, and I am still not over it. And that’s pretty much the main reason it ended up being one of my top reads from 2015! I mean, Esther did such an amazing job giving her own twists to the classic tale (which I haven’t read but know a little about it) that I just. . .don’t know what to say, besides the fact that the wait, once again, was worth it, because she left me speechless! Wonder why? Well, keep reading and you’ll see. . .First of all, I’d like to say that I loved Esther’s writing! Her writing style was so different and beautiful, and everything was so well detailed and paced that I just couldn’t put the dang book down, which made me finish it in just TWO DAYS! And believe me when I tell you this: only good books have that kind of power on me.Plot: Besides being beautifully written, well paced and detailed, as mentioned before, the plot of this beauty was also: beautiful itself, fun and somehow. . .deep (NO PUN INTENDED). Why? Because through its pages, we get to see more than just a story or another retelling, we could see Esther’s message clear and simple, and that was just sooo good! Another thing I loved about this plot was: the reason why the little mermaid was different from her fellow heartless merfolk, yes, including her own family. Which was the pounding heart on her chest that was full of emotions, curiosity and knew what love was. . .and I just. . .*dramatically clutches heart*Another thing that clutched its hands around my heart was the little mermaid’s determination. I loved how she went on a search for love (and her happiness), no matter what anyone said, or the risks she had to take, or the sacrifices she had to make. That was touching, and motivating, and just great. I also loved the settings of the story, how we could see how things were on both sides; in the depths of the ocean where the little mermaid lived with the rest of the merfolk, and on the surface where the prince lived with the rest of the humans that suffered from the Great Condition. It was great to see the difference between the species and just have a change from time to time from darkness to light. And now, since I don’t want to give any kind of spoilers, not even the smallest ones, I’m gonna go and jump right into the last thing I loved up next!I don’t know if it is that I’ve gone a little soft or something, but I completely loved the romance from this book! Yes, even when I felt a sharp pain in my heart with the last four paragraphs of the book, thanks. Why the pain? Because every single twist went right into my kokoro and they just hit me one after the other AND I WAS SHIPPING MY BABIES SO HARD that my feels just. . .Now, the time has come, ladies and gentleman, it is time for me to talk about the characters we got to meet through this wonderful book, wohoo! Guess what?! Another miracle happened with this book. . .I had no problems with any of the characters! I mean. . .I admit that I would have loved to punch the prince in the face more than once, but hey, still no problems with him, because that’s just part of the story (thank God). Anyway, I completely loved our main character: the little mermaid, I loved her curiosity, and her innocence, it was so interesting and funny to see how the author managed to portray it. I mean, she thought a beard was some kind of animal or parasite, and every time she saw one she was scared/uncomfortable about it, and that just got me laughing every time, ok? Now, let’s talk about the prince, at the beginning I found him kind of annoying, but then, after something happened, I saw his change and I was “oh, ok, finally, we’re good now”. . .until the end. . .then he fucked up again!But, ahem, moving on from him, another character that I loved was the man with the animal on his face, aka, the Uncle. I loved this man since his first appearance, and I really didn’t knew why, until the end. THAT’S WHEN IT HIT ME AND I JUST. . .got so sad over it but oh well, I’M NOT SPOILING ANYTHING SO I WILL SHUT UP ABOUT IT. I also loved the evil witch for being such a great villain and having such an amazing and heartbreaking back story *wipes tear*. The King (the little mermaid’s father), her nanny, her sisters and the rest of the merfolk also played a great part on this story, but if you’d like to know more about them and about the sickness that’s threatening their lives, you better get your hands on this one! Because I won’t be spoiling anything. . .*evil laughter*In the end, I completely loved Esther’s debut novel “Drown” from beginning to end, and I can’t wait to see what she has in stores for her next book “Gabriel and the Swallows”! *Copy provided by author in exchange for an honest review*"Sometimes what we are searching for does not exist. We may sacrifice for it, even bleed for it, but it was never meant to be ours."Holy. Canoly.Ever since I saw the words "twisted take" on the cover, I knew my heart was going to love this book. And I wasn't wrong!!! This haunting story is sure to stick with me until the end of time. Esther's writing is magnificent. I don't know how to describe it any better. I already told her this, but this book was far from what I expect a debut novel to be like. It was so much more and it left me speechless. There was a recurring dark and melodic undertone to this story and I loved every minute of it. But as dark as it was, it also had its hilarious moments that I cherished with all I had. Esther managed to make me forget I was human for the extent of the story. This hadn't happened before. She actually made me feel like an outsider to the human world; exactly how the little mermaid felt. The characters in this story were far from what I expected. I didn't expect to grow so attached to them and their happiness . The prince, the uncle, the mermaid... those three were the most perfectly flawed characters in this story and I wanted so much more of them. Not because Esther barely mentioned them, but because she did but I am greedy with characters I love. I found myself relating to more than one character and I always hurt whenever they hurt. I've been thinking of these characters and their struggles constantly already and it's been a few days since I finished this. I've grown obsessed with them. This was a tragic story about love and free will that made me tear up so much by the end. I was a mess and I didn't want to acknowledge that ending. It was devastating but nothing short of eye-opening. My sorrow was up for Esther's taking and boy did she take... Once things were brought together and started to make sense, I felt them like a blow to the gut. The clues were right in front of me but I was so lost in my own world that I completely missed them.If there is one thing you should take out of this review is that I wish this were the original story. I love this retelling infinitely times better than the original and I NEED to see it on the big screen. Even if that ending was far from what I wanted for these beautifully broken characters.4.5 stars! Buddy read with my beautiful, and most favorite person in the world, ZThis book was beautiful. It was such a refreshing read, and such an incredibly written book. Drown is the author's, Esther Dalseno's, first novel and I am incredible impressed by her work. No names, just titles. You have the little mermaid, the Prince, Uncle, the Sea Witch, and among others. Let me tell you something, I hated the Prince. Like completely thought he was a selfish and cruel person. Yet he is the first human the little mermaid saw, and he was just oh so beautiful and the little mermaid was just too naive to know better.I did not read the original story Dalseno based Drown off of, but Z tells me that the novel followed the original's plot line exactly. And I think that is just fantastic. I loved every moment of the book. I felt bad for the Uncle (totally guessed him) where I completely just wanted for him to have that life he pictured, I pitted the Sea Witch, even though it is her fault, my heart did a little sad dance for the King, and all the while, I looked away from the Prince, yet I was secretly, possibly, kinda, happy for him in the end.I would highly recommend this book to my fellow Goodreads friends! Actual rating: 4.75 stars.Não sei por onde começar. Este livro acabou por ser tão mais complexo do que antecipava, e não apenas um simples retelling da história da Pequena Sereia. A minha história de infância preferida. Quero começar por dizer que a escrita da autora me maravilhou, adorei o facto de ela narrar a história em 3a pessoa, o facto de usar um objeto/voz exterior a história para a contar, dando-lhe um toque de magia e tornando-a ainda mais especial. Este livro usa a história da Pequena Sereia para refletir sobre o que nos torna humanos e o que seriamos sem os nossos sentimentos e tudo o que nos torna 'nós'. Fala-nos também de um primeiro amor, e as loucuras que cometemos por alguém que julgamos amar, ou julgamos que nos ama, mas tudo não passa de uma ilusão de atos quase de loucura e o quando esta condição nos altera. Mas que também, sem amor não há humanidade. Encantou-me o facto de a autora criar uma história para como se criou a raça das sérias, uma maravilhosa história que nos despedaça o coração. Tal como todo o livro. Não posso deixar de referir que adorei o twist da história, do facto de o final ser completamente diferente da história que todos conhecemos. Em suma, recomendo vivamente este livro. Não acredito que seja um livro que se leia levemente porque nos faz refletir sobre toda a sua história, mas não se torna difícil de ler, pelo contrário. A história é simplesmente de partir o coração, nunca deixando de ser simplesmente maravilhosa. I want to clarify that this was actually a 3.5 star read for me. I was very close to adding that 4th star.I am unsure as to where I should actually start with this one. I am conflicting internally on how to present this review for various reasons. I want to convey my exact concerns and loves about this story without deterring others or promising too much. Openly, this will not work for everyone. But as the same holds true for all books, that is acceptable. After all, no matter how many times we say it, it will never be more true. Reading is an individualized experience.Read the review here. Well, I hardly pre-order books, but from the moment I saw a picture of this book on Instagram, I knew I had to read it. I have an intense passion for mermaids and all things sea related. Like many before me and surely after me I love the Little Mermaid. I grew up with the disney movies and since the first moment I fell in love with the gorgeous red haired mermaid. It is true, though, that the real little mermaid tale from Hans C. Andersen was little to do with the Disney animated version. I must admitted that I love the original as much as I love the fairy tale version that was latter created. Hans C. Andersen made it much more real and believable to me, as life is not always made of happy endings or corresponded love. So, I knew before hand that this book wasn't going to be childish or pretty in a "princessy" way. I knew it would be dark and raw. I appreciated that Esther kept the tale so close to it's original and yet so unique. I loved that the characters were not presented as perfect, like in the usual fairy-tale style and how flawed and human they were. I must admit that I read this book in less than a day and that at first when I saw it was only 216 pages, I though it would be to short, but rather then that it was perfect. It was the perfect journey through land and sea that I had hoped for. I also loved the fact that from the first moment the reader was all the information, that from the first word the reader knows more that the characters themselves. I found that some events were predictable but it was the most pleasant felling, for as a reader I felt powerful, like when you read something and know that another certain thing will happen because of that and in the end it in fact does. For me this happened on aspects that were different from the Hans C. Andersen version, so while knowing the original tale, this book still managed to surprise me. I was also pleasantly surprised by the way it was written. I am not a native english speaker, but I've read many books in this language before, and yet this book had me enchanted, for it is unlike anything I've read. For me it had a poetical fell and sometimes I found myself rereading a sentence because only once could not translate all the beauty embedded on those words. I thank the author for this marvelous experience. I don't want to say to much...I don't know how that spoiler thing works yet -_- so I'm just going to make the gist of it. Mainly because I have soooo much to say . . . First off! This is my first new adult! And it got a 5 star! That's huge. I didn't know when I was going to decide to read new adult but I did...finally and I am happy that it was Drown. I finished it at one in the morning and I bawled like a baby...I'm not sure why...I was happy but then I was sad then happy again. But I was rooting for someone else...;) I started to love the idea of not having names. There are NO Names in this book, there is the prince, the uncle, the sea-King, the sea witch, the little mermaid, the mermaid, the (whatever number) sister, the sirens, you get the point. I loved the idea of that though...and I've always been a fan of the little mermaid, but now I will always have this book in my head when I think the little mermaid "and that is not a bad thing" And I remember a part she was looking at a church window and I laughed because how innocent she was (Spoiler in parentheses------thinking the sun was god,). So this book will make you cry, smile, laugh. It was amazing. Can't wait for Esther's other book to come out! So READDDDD THIS! From the first time I saw the cover, I knew I wanted to read DROWN. The story inside certainly lives up to the haunting, beautiful cover. As a long-time fan of Disney's The Little Mermaid, I was eager to read a grown-up version of the story. Ms. Dalseno's tale did not disappoint. In fact, it delighted me, if you can say that about a story that left me brokenhearted for our protagonist. It's lyricism was dazzling and the story itself was gorgeously done.I especially loved the use of language in this novel, the descriptions, and the movement of the plot. I don't write plot summaries in reviews, but I do want to say that I did not anticipate the turn of events that unfurled in the last third of the book. It was heart wrenching and sorrowful. Also, the revelation at the end of the narrator's identity was pure magic.Anyone who wants to read a novel that's quite different (in the best of ways) from much of what's popular on the market now, I strongly encourage you to read this book. I'm so glad I got to experience this brilliant debut from a very talented writer. I look forward to seeing future works from Ms. Dalseno! Originally posted @ Miranda's Book Blog"Sometimes what we are searching for does not exist. We may sacrifice for it, even bleed for it, but it was never meant to be ours. "Are you looking for something like you've never read before? Something lyrical, stunning and just downright beautiful? Drown is reminiscent of the tales of old, and it's inspiration was the original The Little Mermaid. No, not Disney's version, but the original Hans Christian Anderson version.Within the pages of this breathtaking tale you will find love, hope, determination, and darkness!The POV in this story was startlingly impressive. It's written in third person omniscient view. I was pretty shocked that I loved the POV choice! I'm normally a first person type of reader, but wow this left me wanting more!Overall I'm so glad I decided to read Drown and am now an Esther Dalseno fan! Perfect for fans of retellings, mermaids and lyrical writing! I absolutely fell in love with this beautifully written book. Even though I knew the original story, I was still so intrigued throughout and I especially loved the backstory of the mer-people. I'm so happy I decided to read it! Best adult retelling of The Little Mermaid I've ever read. Extremely well written in a very mature style that still retains the element of macabre fairytale, that surrounds the original story. Very detailed and heartbreaking at the same time... An amazing book! Okay this book took me totally by surprise. I originally heard about this book from my sister who absolutely loves mermaids. When 3 Little Bird Books put out a request for bloggers to review this book, I knew I had to jump on the chance. I mean look at that synopsis, and that COVER! Let me just start by saying this is not your cute Disney version of The Little Mermaid. I have never read the original tale but I do know how it ends, but with Esther's retelling I couldn't be sure exactly where she was going with it. And I loved that mystery! I could not put this one down and ended up finishing this in like a day.We all know the story of The Little Mermaid, whether its the original or the Disney version... A little mermaid makes a deal with the sea-witch for legs so that she can be with the man she loves. Like I said we all know the story, so I won't go in to to much detail, also I want you guys to go into this novel with no idea what is going to happen. It's so much better that way! The way Esther takes this story though is so interesting. So this story follows the little mermaid, who lives with her family in their castle. But these are not mermaids like we know. They have no humanity, they believe beauty is the most important thing, and they care only for themselves. It was such an interesting take on mermaids. One I have never read before. There is also the sea-witch who is definitely interesting. It's pretty easy to see who she is but as you keep reading you get more and more how she came to be the sea-witch and why she is the way she is.Then there is the Prince. Who because I am a sap, I wanted the little mermaid to end up with him and the great thing about this book is you don't know if they will or won't. She could have taken it either way. But guys, after getting more and more in to the book I really did not want her to end up with the prince, but with his Uncle... Yeah I know you're probably asking yourself why, but honestly just read the book and you will see what I am talking about! These characters were so honest and well thought out and just so well done. There wasn't a character in this book that I disliked. They're all interesting enough that I wanted to read more about each one. This story is told from different perspectives, and sometimes I hate reading multiple perspectives but I thought Esther just did a fantastic job of making each character have their own voice that I wasn't bored reading any different perspective. They were all really interesting characters in their own way. The Little Mermaid had her love for the prince but she worked hard. There was just something about her that I really loved. They all had their own problems and demons and things they had to fight off, that reading about it was simply amazing. Esther did such a fantastic job of making these characters come to life for me. And to see such a dark take on such a beloved classic is just amazing. Going in to fairytale retelling's I think a lot of us expect the story because we've all heard it before, but with Drown that is so far from the truth. It was the journey of the book that I loved. The ending was predictable, but it still surprised me with the way she took it, but not like 'oh I didn't see that coming' more like 'oh that's the way she's taking it'. But nonetheless I loved every second of this story and I can't wait to see what comes next for Esther! If you haven't already, I really suggest picking up this book. It's such an interesting retelling and not to mention it's a fairly quick read. I was completely blown away by this story! Very well-written and imaginative! I was at first skeptical, having read a bunch of reconstructed fairy tales, I did not believe that this novel would be any different. And in the search for a book that had mermaids, I came across some very appalling or just strange novels that made me retire my pursuits and believe that an amazing novel with mermaid was nonexistent. Luckily, I was proven wrong. It was a very creative and fresh interpretation of the tale, dark and beautiful as the mermaid discovered the danger of human emotions. I was hooked from the first page, the writing is amazing with the attention to detail and the underwater setting was enthralling. How Dalseno paid such close attention to detail, the kingdom, and its customs–you can tell she took her time to craft such a masterpiece and I admire that. I love a novel where the setting is painted meticulously and it was definitely needed for a book underwater–I could almost believe I was there!I liked how the story followed the traditional route of the original fairy tale rather than the Disney version–the real tale is forbidding and does not have a tradtional/happy couple/ love wins all/ happy ending. All the characters were intricate with their faults and desires and I loved how the author made the Prince to be a whiny, sullen boy. Yes, he was handsome and intelligent but I found it compelling that he was filled with so much darkness–his doubts and insecurities his most formidable enemy. It was hard for me to like him, but I can understand his motives because his emotions were so real.The little mermaid was charming with her naiveté and curiosity, her eagerness for love and fulfillment relatable. I pitied her because she was not ready for life's disappointment but I am glad she was not with the moody Prince.I do not recommend this story for those looking for the Disney version but for those who want to be enraptured with a dark and wicked tale.Very amazing! Five stars! Fans of Hans Christian Anderson's The Little Mermaid, rejoice! 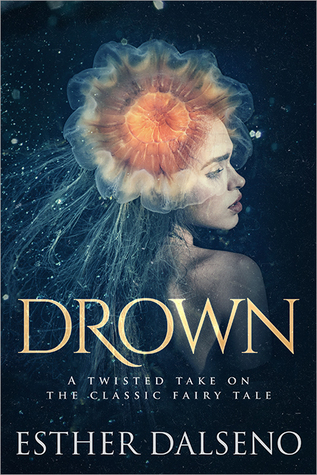 Drown stays true to the basic fairytale plot line while giving the reader deeper insight of the characters: Mermaids do not understand emotion, most of all love; their hearts don't beat and their faces are beautiful but without inspiration. The Little Mermaid princess always knew something was different about her from her sisters; she longs to be with humans and their Immortal Souls and their God. The Sea-Witch's former humanity does not stop her from misunderstanding human life. The Prince suffers not only from teen angst, but severe depression. His Uncle is mindful, but perhaps without the best moral compass... There are enough details about all of them to really understand them, without feeling as though you're suffocated in details, which is a blessing. Also, none of them have names (true to the original).Situationally, there are a few unexpected, but welcome, turns of events that should keep even the most knowledgeable Mermaid fans on edge. Esther Dalseno's writing is gorgeous, with vocabulary worthy of high school classroom study, which manages to remain natural to the storytelling feel of the third person, semi-omniscient POV. The melancholy lesson of the story is that rejection is not the end of the world, even though it may feel as such in the moment. By turn humorous, heartwarming, curious, and despairing, Drown is a remarkable retelling of a beloved story, worth every fairytale-lover's attention and accolade. Esther Dalseno - Esther Dalseno was born in Australia. After living in both Portland, Oregon and Sydney, New South Wales, she headed off to see the world.Writing and teaching, she has lived in Laos, Vietnam and South Korea and has traveled the world extensively. She now lives in with her family in Berlin.